In this lab students pick a lettered alien (A - I), and they have to decipher the DNA code. 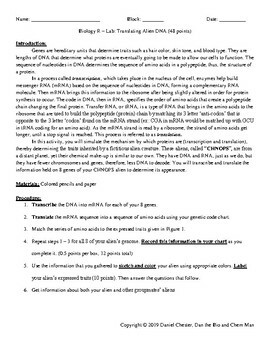 They must transcribe the DNA into RNA, and then decode the RNA into amino acids. Afterwards, they use the chart in the lab to figure out what version of each of the 8 traits that their alien has. Once they get this, they have to draw their representation of their alien and label all 8 traits on it. 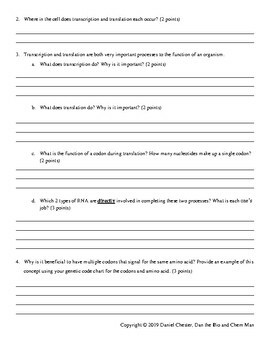 There are questions to complete as well to assess their understanding of transcription, translation, and mutations. 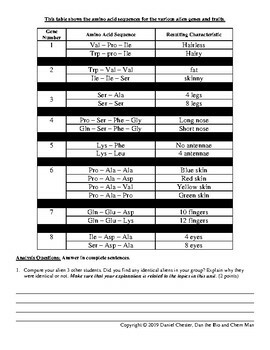 This includes basic information about each process, why they are each important, how they are related together, comparing their alien to other students, and more. 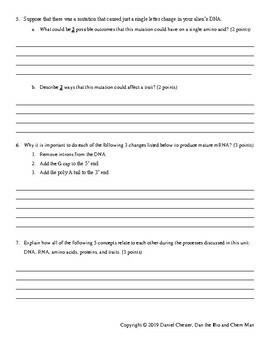 This lab works as a good assignment to wrap up a discussion about DNA, RNA, and protein as it relates all of the important ideas together, gets them to work with other students, and assess important information. They make the unique alien their own, and they have to figure out aspects of the lab themselves. Included is the key for lettered alien DNA but not the questions (A - I).